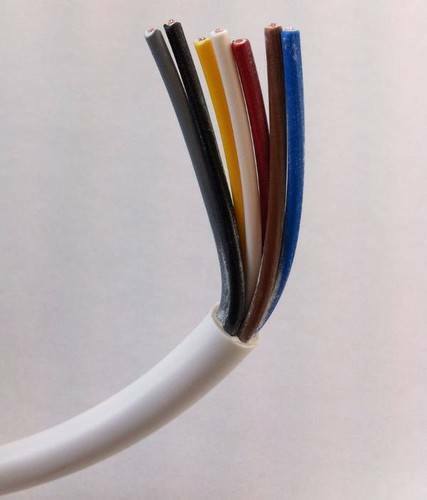 6 Amp Blue, Brown, Black, Grey, White, Yellow & Red H05VV-F Flexible Circular Wire for Indoor & Outdoor uses up to 500V such as Electric Motors, Heating & Cooling Controls, Central Heating Pumps, Low Voltage Lighting & Switching. A quality, well-constructed product which is easily stripped and worked with. Fast delivery and the product was exactly what I wanted at a great price. I will use again. Needed a short piece of 7 core flex to wire up my smart hot water switch to my programmer, so only wanted to buy a metre of flex. Competitively priced supplier, and more importantly no delivery charge, product is excellent quality. Delivery was not quick, but fortunately I was not in a hurry. Would definitely recommend this supplier. Cable arrived promptly and is exactly per the product description. Great to find somewhere online to sell just 1 metre. can you give me the outside diameter of the cable please - ie how thick it is please! Electrical World Replies: The outer diameter of the cable is 10mm.